This timely and important book is not a benign reflection on humanities' role in architectural design but a direct response to the increased marginalization of humanities in a technology driven world. The prioritization of technology leaves critical questions unanswered about the relationships between information and knowledge, transcription and translation, and how emerging technologies can usefully contribute to a deeper understanding of our design culture. Soumyen Bandyopadhyay is Professor of Architecture and Design at Nottingham Trent University and has previously taught at Liverpool University. 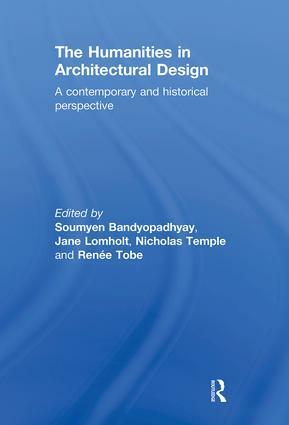 Jane Lomholt is a Senior Lecturer in Architecture at the University of Lincoln where she is head of History and Theory. Nicholas Temple is Professor of Architecture at the University of Lincoln, having previously taught at the University of Liverpool, the University of Pennsylvania and Nottingham University. Renée Tobe is Architecture Field Leader at the University of East London.